Clemson is part of a high-tech effort to break the cycle of poverty. Imagine leaving an online review without having to write a single word. Thanks to Sullivan, there’s an app for that. A 1990 PSYCHOLOGY GRADUATE and clinical psychologist, Brian Sullivan is also the co-founder of Vizbii Inc., a technological communication company headquartered in Charleston. Vizbii is home to Morphii, a platform that’s changing the game for measuring emotion in the professional world. With more than 20 years of experience teaching and working in the counseling center at the College of Charleston as well as in private practice, Sullivan watched as his patients struggled to describe their feelings using traditional scales and typical Q&A formats, sparking the original idea for the Morphii project. “What I quickly found was that the traditional method, especially when the answer format is a scale with some numbers on it, is too far removed from their actual experience,” Sullivan explains. His patented solution is a collection of morphing cartoon faces called “morphiis” that are embedded in an analytics database platform. His co-founder, and now wife, Corey Sullivan, animated the idea and then developed several prototypes to perfect the application. To combat the drawbacks of scales and questionnaires, morphiis are equipped with a sliding scale. Each morphii represents a different emotion — happiness, anger, disgust or surprise — and the scale is used to adjust the intensity of the morphii’s expression. This feature helps the participant account for a much larger range of emotions than the traditional numerical scale. Morphii can be used in business or health care settings and is incorporated into mobile- and web-based applications to easily capture and measure emotions. “It’s like an emotional Intel chip inside a computer,” Sullivan says. 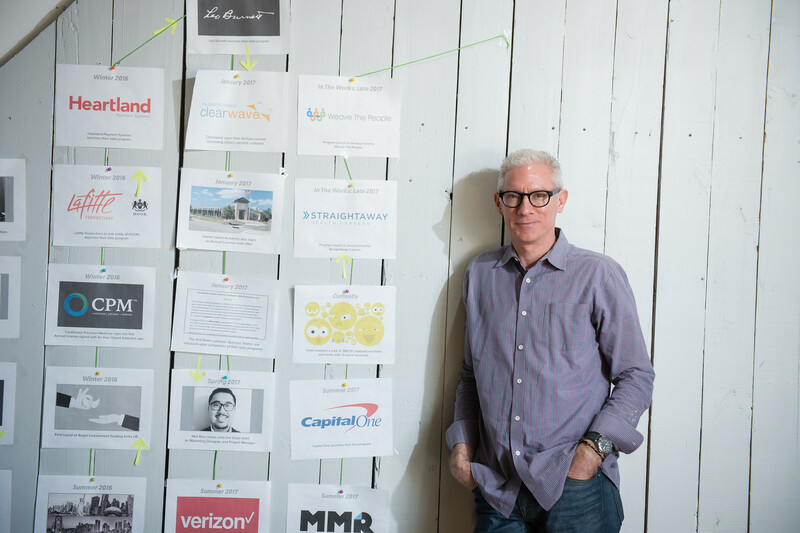 Recently, Vizbii has helped big-name brands like Verizon, JetBlue and Capital One incorporate Morphii into development projects. Other clients include a preschool on Daniel Island that uses the application to assess teacher and employee engagement as well as parent satisfaction and a physician in North Carolina who is integrating Morphii into his practice to identify patients who may be on a pathway to opioid addiction. Morphii’s usefulness across a range of industries has Sullivan excited for the future of his smiling — and frowning — faces. Nat Bradford eased his pickup into a parking space at Moe Joe Coffee. He stepped out, straightening into a lanky, lean-faced guy in work-worn jeans and shirt, logoed visor and Blundstone boots, looking like what he is: a son of the soil. He had something for me. Bradford dropped the tailgate, leaned in and wrapped his arms around his family’s past and future. It was a watermelon the size of a toddler. Dark green, slightly ribbed along its oblong flanks, weighing about 30 pounds, a classic Bradford watermelon. That night, my wife and I had watermelon for supper. We had to eat half of it just to get the rest into the refrigerator. The sweetness was superb, but it was the flavor that won out. The melon tasted like the watermelons I ate when I was a kid in the ’50s. That is the Bradford signature — a flavor of memories. The Bradfords have been growing their watermelons for more than 170 years. In all those years, it’s doubtful they made enough from their melons to buy a new truck. Most of the melons were given away to friends and neighbors in Sumter, where the sandy soil is well suited for a melon patch. Others did make money. In the late 1800s and early 1900s Bradford melons were sold commercially, as was seed to gardeners. Along came melons that were easier to grow, store and ship, pushing the big green melons back to family patches cared for by seed keepers who passed on their know-how and best seeds from generation to generation. Bradford is the eighth generation in his line to take up the hoe. This time there’s more at stake than a good harvest. Bradford is sowing the seeds for his family’s future. He’s also determined that the Bradford watermelon will help to make the world a better place for thirsty people. With two year’s experience growing melons part-time, the Bradfords are making a move. This summer, Nat and Bette Bradford and their five children will resettle from Seneca to Sumter. They are returning to the Bradford family farm to grow a life on 12 acres. They will raise watermelons and other crops sustainably, without irrigation and chemicals. They will sell some fresh watermelons and use the rest to make watermelon rind pickles, watermelon molasses and distilled spirits. Seeds from the best melons will be saved. Money from fresh market sales will support Watermelons for Water. In its third year, the family’s foundation helps people in need of clean, dependable water. A project the Bradfords fund in Tanzania is well underway. It’s a big dream, but Bradford watermelons are big melons. It’s hard to imagine a melon that immense becoming a melon of mystery. The Bradford went from being one of the most popular melons to near extinction. By the 1850s, the Bradford watermelon had developed a reputation for sweetness and for its edible rind. The crisp meat of the melon, ranging from pale pink to deep red imbedded with white seeds, was a sugary treat to eat fresh. The high-sugar content also made it a favorite for making watermelon molasses. A thin white rind, which turns translucent amber in cooking, made delicious watermelon pickles. “They are very nice and will keep for two years,” writes Maria Massey Barringer, in Dixie Cookery, or How I Managed My Table for Twelve Years: A Practical Cook-Book for Southern Housekeepers. A melon of such quality did not just appear. It was the offspring of good stock and careful breeding. Nathaniel Napoleon Bradford was part of agrarian bloom in the South. Farmer-experimenters shared seeds and sought to raise fruits, grains and vegetables that were both hardy and flavorful. Agricultural societies, such as the Pendleton Farmers Society to which Thomas Green Clemson belonged, published journals detailing their efforts and observations. Nurseries offered catalogs of their stock. More than simple inventories, nurserymen described and critiqued plants. The research made its way to the marketplace. The Bradford became a late-season market melon sold throughout the South. It was a popular melon, but flawed in the eyes of truck-produce shippers who sought to expand their sales to other regions. Breeders developed “boxcar melons” with “rhino-rinds” that made them tough enough to be stacked nine high without crushing. The bowling ball watermelons lumped in cartons at grocery stores are the latest varieties bred more for commerce than flavor. The Bradford withered in popularity. Once grown in seven states, by 1925 it was grown only in South Carolina, where it hung on by a tendril. One of our nation’s founding watermelons would have been lost had it not been for one man. Nobody knows how he came to be called “Chief,” the man who was Nat Bradford’s great grandfather, Linwood Bonneau Bradford. “I’ve known about him from family stories, but I did not meet him,” says Bradford. Family stories tend to deal with family doings — births, deaths, marriages, vacations — and not about growing watermelons. Fortunately, someone wrote about Chief and his watermelons. Clemson Extension agent Jim Eleazer turned out to be a skilled writer, having a book published, 50 Years Along the Roadside. For 25 years before World War II, Eleazer was the Sumter County agent, where he became friends with Chief, who grew his late-season watermelons as a hobby. The rest of Eleazer’s story dwells on Chief’s generosity, filling the agent’s car with watermelons. 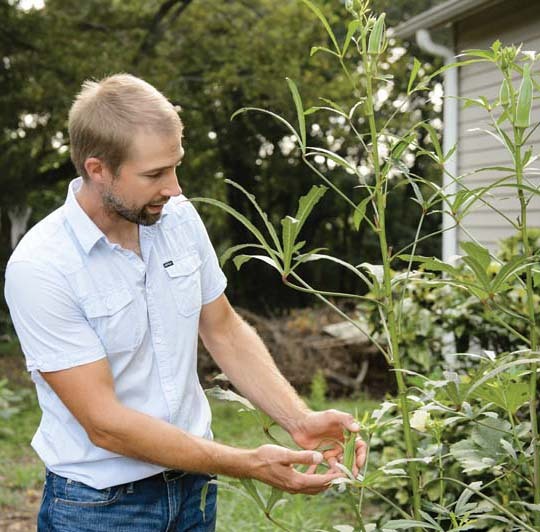 But for Nat Bradford, the few sentences about his great-grandfather being a seedsman would become a guiding principle for his own approach to growing plants. Chief’s son Theron — Nat’s grandfather — would play another part. He would teach young hands to fulfill the dream. “I called him ‘Paa Paa,’” says Bradford, who loved to work with his grandfather. They would plant and tend the vegetables and flowers. Nat, more than his four siblings, took to gardening. He soaked up what Paa Paa knew about making things grow. The Bradford principles rest on abiding with natural forces, caring for the land and observing a divine plan for abundance. Nat, the one with the “green gene,” as his family calls a gift for growing, learned to plant at least a mile away from neighboring melons, to prevent cross-pollination. Save seeds from the very best melons, preserving growth traits. Don’t irrigate or apply chemicals; instead cultivate plants suited to local conditions. Care for the soil, and the soil will care for you. Paa Paa’s son — Nat Bradford’s father — left the farm to become a doctor. When he returned he moved his family to the city of Sumter. A dermatologist, Dr. Bradford’s connection to farming was treating the consequences — cutting away skin cancers from sun-rayed hands, arms, cheeks and necks. His children, like so many others, moved farther away from farm communities. Nat, a solid student and able athlete, went off to college, looking for a future. He did not know it yet, but he would come full circle. Clemson was a good fit for Bradford. He found a major that nurtured his passion for growing plants. He found sport that matched his enjoyment of teamwork. He found love. While his dream of going for the gold faded, romance bloomed. Before they could begin their lives together, Bradford had his degree to complete. Majoring in landscape architecture, Bradford had an internship at Longwood Gardens in Kennett Square, Pennsylvania. There, he worked on his senior exit paper. The gardens had a collection of old horticulture journals and catalogs. Bradford came across a document from the 1860s. It stunned him. It was a vegetable critique, listing best choices for home gardens for that period. Bradford looked for watermelons. He found his name. Bradford began searching for more information. He hit a dead end. Life goes on, ready or not. Bette and Nat married. They started a family and Eco Art, a landscape design and installation business. Twelve years passed. Meanwhile, Google blinked awake, ready to answer a world of questions. In 2012 Bradford went to a sustainable agriculture conference in Greenville, reviving his quest. Was the watermelon mentioned in the 1860s the same one that his family had been growing? “I knew in my heart of hearts it was, and now I had Google,” says Bradford. He didn’t find the answer. But he found someone who did. David Shields, a professor at the University of South Carolina, is an international expert on Southern food history, particularly agriculture journals, catalogs, cookbooks and seed lists. Bradford hit the send key after midnight. When he woke he had mail. “I had an email waiting for me at nine in the morning with this big, ‘Oh my gosh. I’ve been looking for this watermelon for the past 10 years,’” recalls Bradford. Bradford learned his family watermelon was dropped from sight in 1922, when an Augusta, Georgia, seed company stopped carrying the seed. Shields wanted to know from Bradford one thing — the only thing that mattered. Were there any Bradford watermelon seeds? Bradford had some, but he would need seed from other years to blend the genetics for top quality melons. He went to Sumter to search where Paa Paa may have saved the seed. Summer 2013, Bradford planted two small plots, one in Sumter, the other in Seneca. He couldn’t have picked a worse year. It was one of the wettest years on record. Vegetables rotted in fields. Gov. Nikki Haley declared a disaster for growers. Bradford was nervous, but he trusted in the ways passed on to him. Delighted by the abundant harvest, Shields expected to see South Carolina’s heritage watermelon return to markets and kitchens. Bradford, unfortunately, had made other plans for the melons. They were bound for a distiller in Alabama. Shields is devoted to restoring the crops and foods that nourished and flavored the South, especially the South Carolina Lowcountry. There is hardly a Charleston chef who hasn’t consulted Shields on vegetables, grains and meats of the Carolina Rice Kitchen, the cooking and ingredients of coastal Carolina. Shields called a friend who could save the watermelons from leaving South Carolina. The friend, founder-owner of Anson Mills, has restored the good name of flavorful and nutritious grits and revived Carolina Gold rice, a dietary and economic staple of the coast until rice cultivation collapsed in the Carolinas. Glenn Roberts persuaded Bradford that there was a far better destination than Alabama. Bradford hauled a trailer carrying 300 melons to the Holy City. 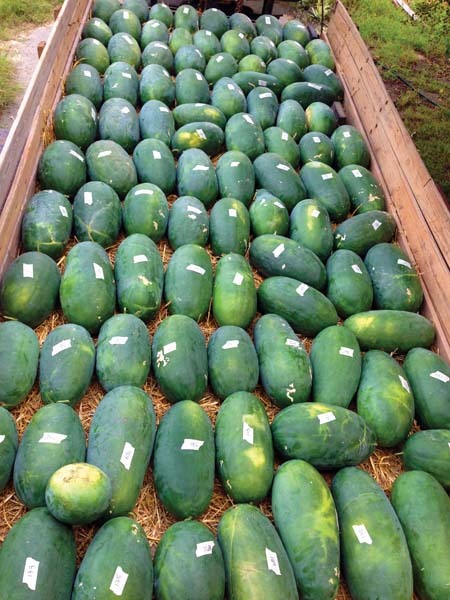 Fifty of the melons — their seeds to be saved — went to McCrady’s, Chef Sean Brock’s highly rated restaurant in Charleston. 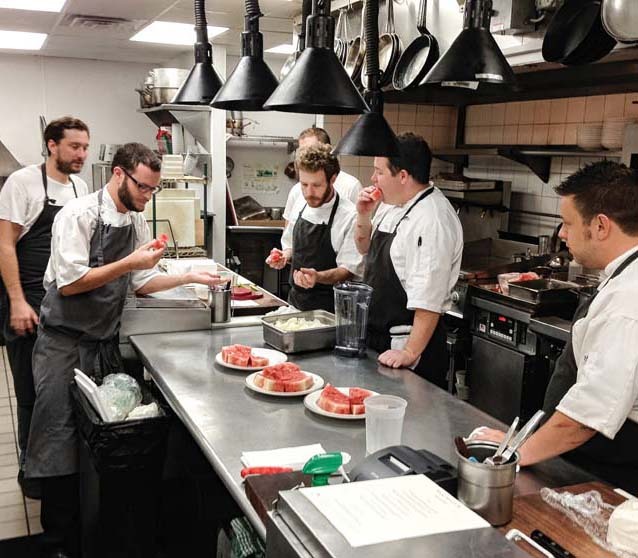 Bradford still gets a kick out of the photo where the chefs and staff stacked the melons on the stairs to the kitchen. The pulp was boiled down to make watermelon molasses, the rind made into pickles. The rest of the melons, selling for $20 apiece, sold out immediately. Praise from chefs will help spread the word about Bradford melons. The local foods and farm-to-table trend continues to grow. Still, fresh watermelons sales are a seasonal and risky moneymaker. Until they’re settled in Sumter, Bradford will continue his landscaping business. Like with most family farms, a job in town is essential to make ends meet. The goal is to go all in. 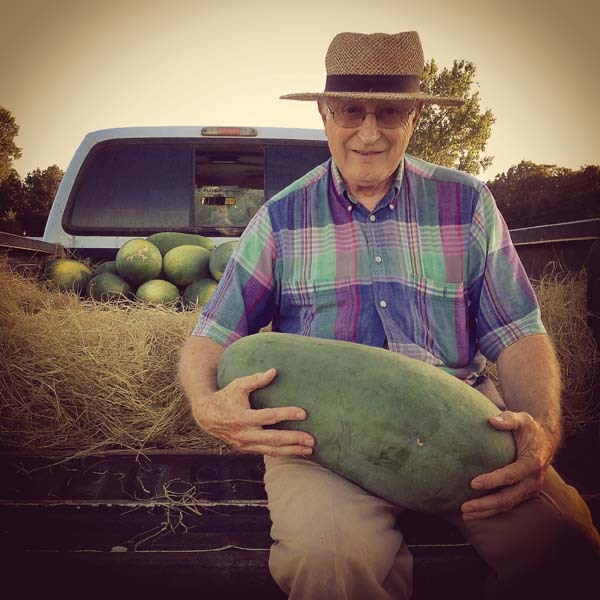 To have that happen, Nat and Bette Bradford will use the whole melon — from rind to seed. The first of the Bradford family product line is watermelon-rind pickles. Other items soon will be available, including molasses and vinegar. 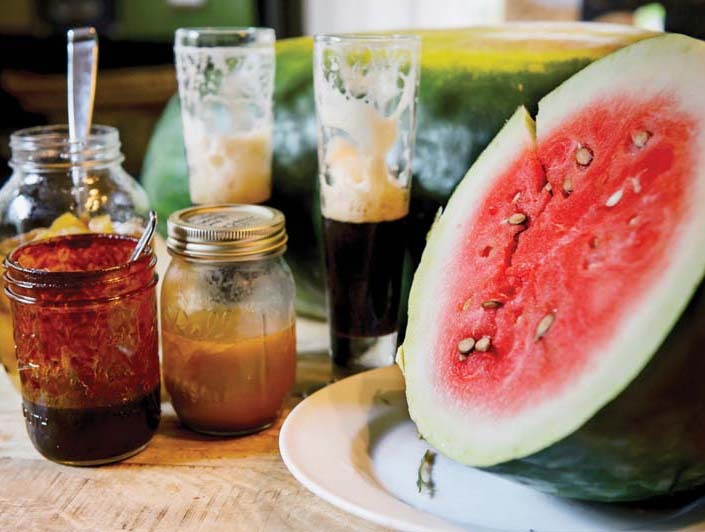 Recently, High Wire Distillery in Charleston made a batch of watermelon brandy. Diversifying, Bradford collards will find a spot on the family farm. Other heritage produce is sure to follow. “Here, a gift,” says Bradford, handing me a quart Mason jar of watermelon-rind pickles when I visited. Grateful for the generosity, I counter with cash. Bette folds the money and nods thanks. There are no sustainable farms without sustainable farmers. Learn more about Bradford watermelons. Peter Kent is a news editor and writer for Clemson’s Public Service Activities. Laura Zucker, Anita Zucker and President Clements in front of Jonathan Zucker at the ground breaking. 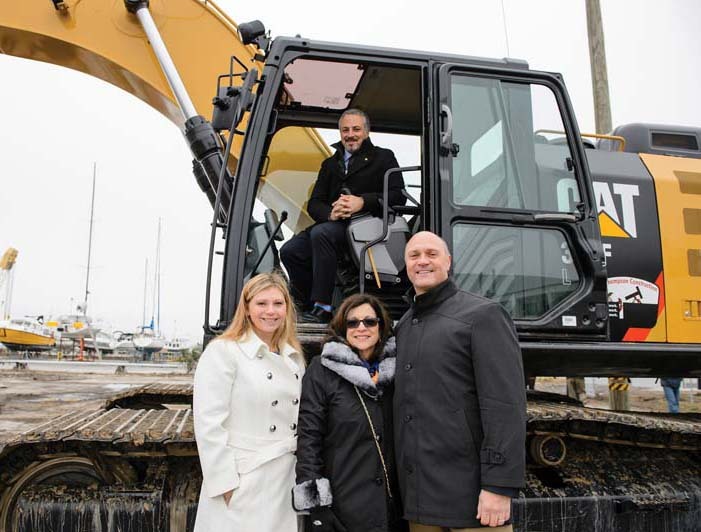 It wasn’t your typical groundbreaking, but Jonathan Zucker certainly broke ground with a giant black and yellow excavator, marking the official beginning of construction of the $21.5-million Zucker Family Graduate Education Center in North Charleston. Located at the Clemson University Restoration Institute on the site of the former naval shipyard, the approximately 70,000- square-foot center will offer master’s and Ph.D. degrees in engineering when its doors open in 2016. The center is expected to grow to accommodate approximately 200 students, filling a critical need for engineers for corporations such as Duke Energy, where 60 percent of its engineering workforce will be eligible for retirement in the next five years. Upon completion, the Zucker Family Graduate Education Center will serve as the academic anchor in the CURI applied technology park. In addition to students and faculty, office space in the center will be leased to industry looking to engage with faculty, students and researchers. The Zucker family gift is part of the $1 billion Will to Lead for Clemson campaign. Two weeks after Helen Turner Hill became executive director of the Charleston Area Convention and Visitors Bureau (CVB), Hurricane Hugo hit north of Charleston. How could anyone imagine a bigger challenge to a new position? Twenty-four years later, Hill has proven she was more than up for the challenge. 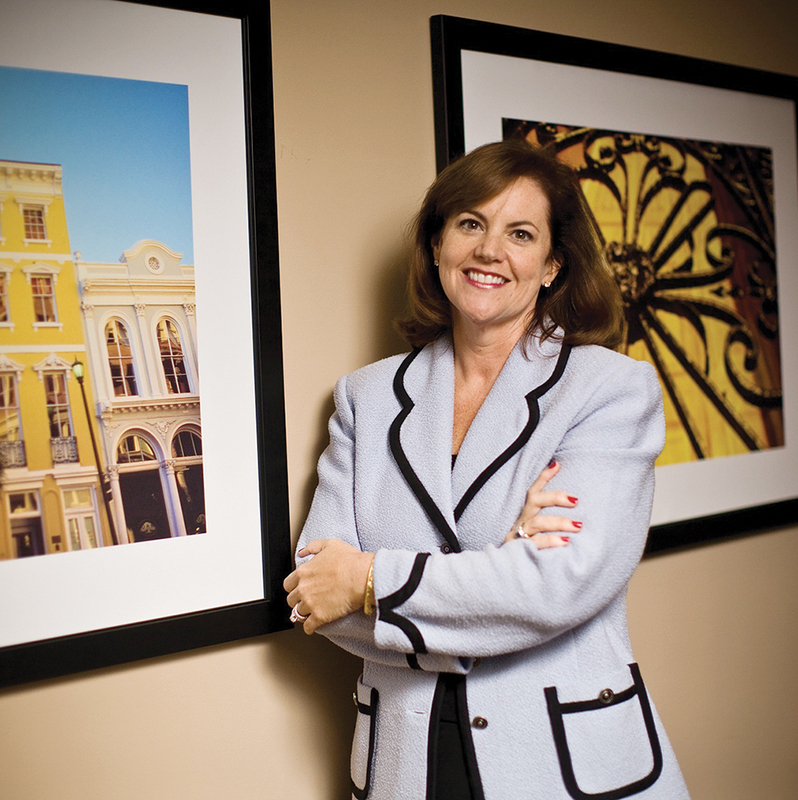 Under her leadership, Charleston is world renowned with back-to-back No. 1 rankings from readers of Condé Nast Traveler magazine as the nation’s best tourist destination and, last year, best-in-the-world. 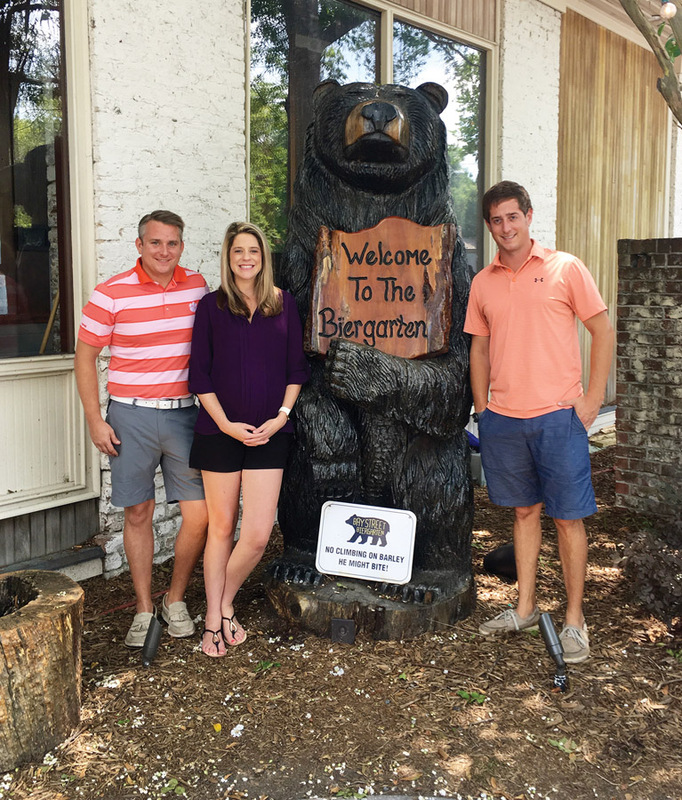 The Charleston native earned her degree in parks, recreation and tourism management and returned home to put her education to work. She was concierge at Wild Dunes Resort before moving to the Charleston CVB to sell ads for the visitors’ guide and later was sales manager for meetings and conventions. Her hard work and natural fit to developing tourism moved her into the executive director position. When Hill came to Clemson, she wanted to join her father, the late Robert M. Turner ’61, working for his mortgage company. Hill says that working with the College of Charleston’s Office of Tourism Analysis guides their purchase of advertising and marketing programs to help contribute to economic development. Statistics have shown that 4.83 million visitors brought in $3.58 billion to the Charleston-area economy in 2012. That’s about one-fourth of all tourism dollars in South Carolina. “It’s the history that makes us special,” Hill said. “There is not another place like this in the United States of America. This is not Anywhere, USA.